Contemporary Artwork by Marisa Avano. 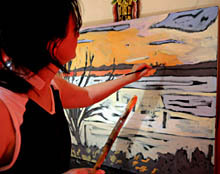 Marisa has a unique way of transcribing what she sees and feels into her paintings. Her painterly style incorporates expressive brushwork and vivid colour. A combination that results in strong soulful works that interpret experiences of her environment. nearing the end of another working week when most city workers gather for a mass exodus to the suburbs for a weekend retreat. 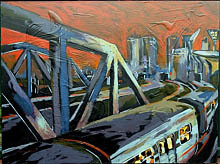 The painting captures the transition between one moment to another – responsibility and freedom, and a common link to the city. Born in Melbourne Australia, Marisa grew up in a family of artists, and has been exposed to art from an early age. She explores observations made during her travels around Australia and works from her studio in the Dandenong Ranges. 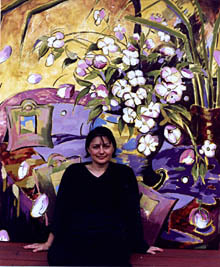 Her work forms part of local and overseas private collections.